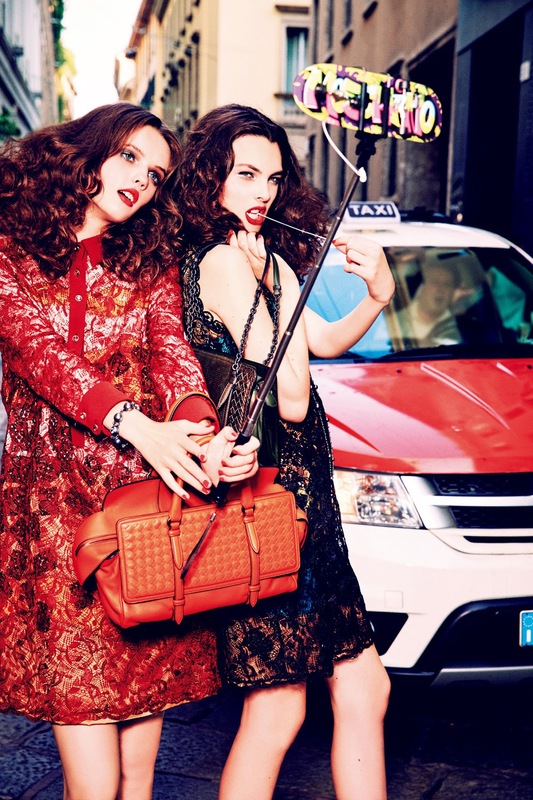 Photographer: Ellen von Unwerth. Model(s): Anna Grostina, Vittoria Ceretti. Source: Vogue Japan. Stylist: Alice Gentilucc. Makeup: Adalberto P. Hair: Davide Diodovich. 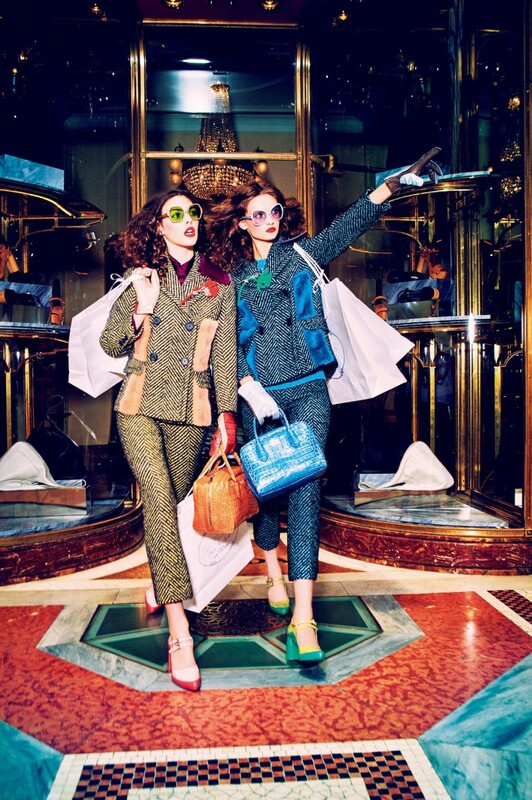 Anna Grostina & Vittoria Ceretti go money manic in Milan for a ‘Fun Time in Montenapoleone’ by Ellen von Unwerth, Vogue Japan, September 2015. Devoured by decadence, Anna and Vittoria invade an upscale street in the heart of Italy. Entranced by elegance lost in luxury, this hypnotic piece looks at the intoxicating effects of extreme spending. 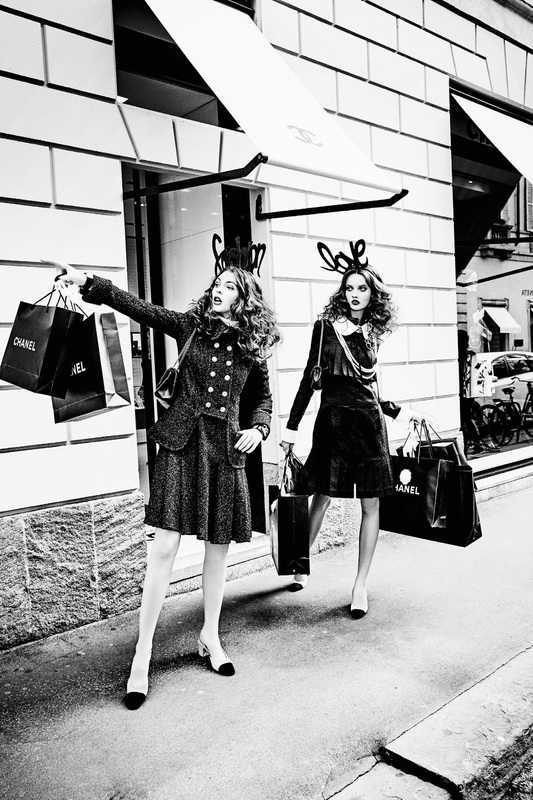 Not one to hold back, Unwerth embraces the high tempo beat of sport shopping. So weather you roll your eyes or play along from the start – this game is only for the haute of heart. Modern fashion celebrates the upcoming season by fielding artistic stimulation. Stylist, Alice Gentilucci, emulates vintage designs by reviving retro flavor with Armani, Chanel, Dolce & Gabbana & Jean-Paul Gaultier. A collection that includes menswear inspired suits, bold tweeds, lace mini’s & dresses that appear like poufs of pastry. Each piece projects a double hit of pleasure in this playful take on twin-peak attire. Beauty embraces the era as (Makeup Artist) Adalberto P gives a shout out to the 70’s. Red lips scream to be seen with a flat, rich color that captures our imagination. By tripping the light fantastic the film creates a concept of over-exposure. Etched to perfection, white liner highlights the lids leaving ethereal shadows to lurk in its midst. Eyes erupt off the page while skin is left smooth as silk. Hairstylist, Davide Diodovich, doubles our pleasure with rich curls that cascade down the back in a fit of fevered reverie. Keeping the tone & tenure of a specific time while still moving ahead, that is the definition of decade jumping. Images from We are so Droeë.